Franklin C. Salisbury, Jr., M.Div., J.D. 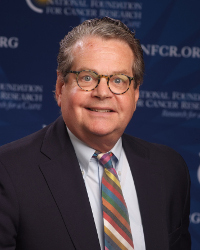 has served as the Chief Executive Officer of the National Foundation for Cancer Research (NFCR) since 1997, leading NFCR to expand its cancer research program from basic cancer research to translational and clinical research so that the cancer research discoveries made at the bench might reach patients at their bedsides faster. Under his leadership, the 40-year old NFCR has become one of America’s largest public charities dedicated to cancer research. Franklin came to lead the NFCR after a diverse background in economics, law and religion. Trained as an environmental/public utilities economist, he served as Chairman of Washington, DC’s Consumer Utility Board in the 1980s. Franklin holds a B.A. in economics from Yale in 1978, a Masters of Arts degree from the University of Chicago, and an M.Div. from Yale Divinity School. He also earned his J.D. from the University of Georgia in 1992. Your ticket for the: Franklin C. Salisbury, Jr.